Add this to the list of new experiences – actually two new entries for the list – buying a vehicle site-unseen and having a vehicle delivered to your home…nice!! Kind of crazy buying anything without putting your eyes on it, but our choices were extremely limited. In other words, unless we wanted a cargo van, a Ford Expedition EL was the only option for our family. And having it delivered? That happened because the dealer was kind enough to sympathize with how busy our lives are now and offered to bring it out to us to save us some time! It may take a giant shoe horn and several volunteers to make it happen, but believe it or not, our entire family, car seats and all, will fit into the new ride. So, when we happen to wake up at six am on a Sunday morning, we’ll actually get to go to church as a family…yeah!!! Sorry for my silence the last few days. I’ve been playing a lot of catch up with work, bills, school, getting to know my wife and daughter again, and simply getting back into life…a new life, but life nonetheless. We’ve found a mini-rhythm to our days which will probably change in the next few days, but we’re enjoying the beat we’re marching to at the moment. We have had Grandma Stevie (Casey’s mom) and Nana (my mom) in town since Casey got home from the hospital which has been a huge help – laundry, dishes, dropping off and picking up Eliot from school, grocery store runs, cooking meals – these are all activities we have not had to worry about, thank God!! The help leaves on Sunday so, like I said, the rhythm will change…soon! During this time, Casey and I have spent as much time at the NICU as possible getting to know our babies as best we can. We live in a different world when we pass through the NICU doors – the babies in their protective environment of the isolettes, tethered to the multitude of chords and wires under the watchful electronic eyes of the monitors, the gentle hum of the nasal canules that help them breathe, the frequent sounding of alarms, and the ever present care of the nurses and doctors surround us. As yesterday’s heart rate drop on Britton quickly reminded us – we are very grateful for this environment and acutely aware of how necessary it is to our babies’ survival. The nurses and doctors are absolute pros at what they do and they do it with a unique sensitivity to our needs and concerns that can only come from bringing your heart to the job. They are truly a credit to the nursing profession! It is frustrating for us on some levels that the first 60+ days of the Quints’ lives and of our relationships with them will be spent in this environment, however. Despite the necessity of their stay, the quality of their care, and the amount of love they receive from this special group of professionals, it is hard for us to connect with the babies here. The separation is very real when they are in their isolettes. Though we can reach in and touch, it is very difficult to talk to them or interact in any way while they are in there. When we hold them, they sleep, and we generally have to hold them up so high on our chest that it is difficult to even see them. We must be mindful at all times not to overstimulate them in any way which, among other things, means no looking them directly in the eye, very little movement when they are held, and keeping their heads held in a very specific position. Though we spend 4-5 hours with them every day, we are not truly responsible for their care at the moment and this is a strange feeling to us. They are not fed at mama’s breast, but rather with milk which is pushed through a tube by a pump. They are lulled to sleep by the hum of the machines they are connected to, not by the sound of our voices singing them lullabies. And their cries are placated not by the gentle warmth of Daddy’s chest as he rocks them slowly, but generally by something only one of the nurses can fix. All of this is necessary to the babies’ well-being, and as the multitude of moms and dads who have been through this same experience will tell you, it is also heart-wrenching to the parents. There is one other thing that is different about our interaction with these babies – being as premature as they are, they are not expressionate and interactive with you. Mostly they sleep with their mouths slightly open and very little expression on their faces. I didn’t even realize this was different until Brooklyn stole my heart yesterday with all of the faces she was making at me as I was holding her. For about 10 minutes, Brooklyn was wide awake and ready to please! She was smiling, working her little tongue around her mouth, her eyes were darting back and forth in response to different sounds around her, and generally acting like new born babies act. It was really cool and it reminded me of how fun it was to get to know Eliot in the first few days of her life!! We know that all of these activities I am now lamenting the absence of will come to us in due time…and when they come, they’ll come like a tidal wave!! They are making great progress every day and, honestly, they’ll probably be home sooner than we are ready. Brooklyn seems to be the leader of the pack – she is completely off of breathing tubes as of yesterday, she is the first to show us some personality with her facial expressions, and she is the first one to take a full bottle feeding (Lila took a small bottle feeding before her). Brooklyn was also the biggest at birth and continues to be the biggest girl. Jack continues to eat and grow and sleep and not much else. Britton is still our little diva, making everyone aware of her displeasure at a moment’s notice, though Ryan has emerged as a close competitor for Britton’s diva title! Lila has settled into Jack’s way of thinking and spends her days on the chill side of life. We’ve had a couple of busy days and I’m running a little behind, but I wanted to post a quick update so everyone knows that all is pretty quiet on the Quint Front for the moment. We have two doctor visits this week – one tomorrow with Dr. Reich and one Thursday with Dr. Berry – but so far not much has changed in the last few days. Casey is certifiably miserable right now, but isn’t begging for the babies to be pulled out just yet. It’s safe to say she hasn’t lost her sanity…yet! We had a great Sunday kickoff at our church, Riverbend, this week and we were on TV again this morning, but I’ll have to blog more on those topics later. Go to the media page of the website for the link to the TV interview! 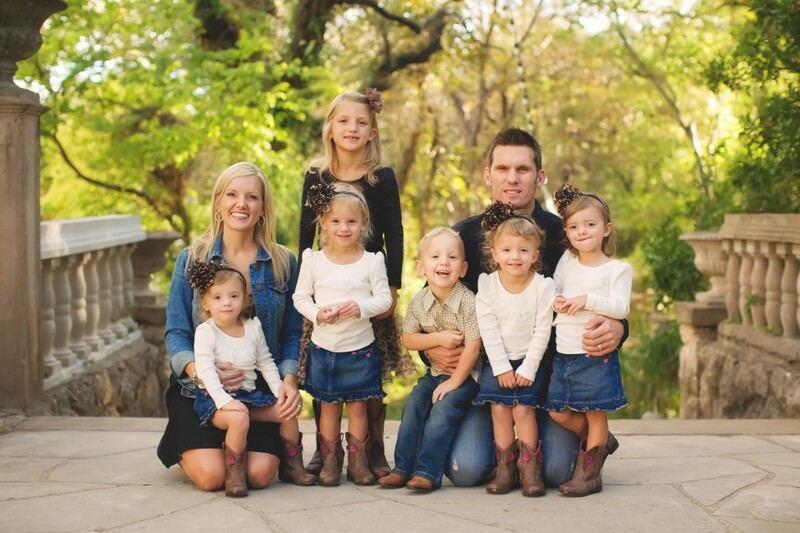 Thanks so much to all of you for your continued prayers and support! Over the Christmas break, the nursery really started to come together. My mom and I went out to buy curtains for the room (an activity that proved to be much more difficult than I imagined!) and my dad put them up. Then on New Year’s Day, Payton, Mark, and their daughter, Harper, came over to bring us lunch and hang out for a while. 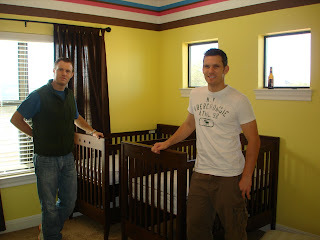 Before heading our way, they stopped by Babies ‘R Us to pick up two of our cribs that had been delivered and they helped us put them together while the girls played and Casey held down the couch (Thank you, Merriman’s – y’all ROCK!). 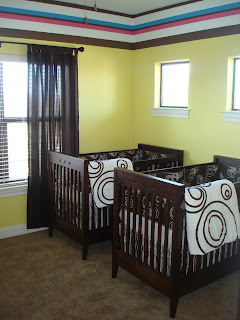 With that, the last thing needed to complete the nursery will be the three cribs that haven’t been delivered yet. I think the babies will like it…even Jack! – Today, we passed another milestone – week 26!! The next two weeks are the most critical two weeks we’ve had to date…statistically, the survival rate skyrockets and the defect rate plummets during these next two weeks…say your prayers, please! – The producer for A Baby Story called today and said that it looked like they were going to get the green light and that she was planning on flying in on Monday with a film crew to do two days of interviews and filming for “Act 1” of the story they were going to do on us. Very exciting!! However, at the end of the day, she called back and said that a last minute legal glitch has put everything on hold for about a week. She still thinks everything will work out fine, but can’t risk spending the money on flights, etc. until she knows for sure. Bummer, big time, but we think it will happen. Hopefully they’ll get it worked out and get a crew down here before Casey goes to the hospital!! 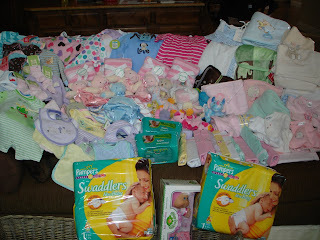 – We were surprised today by a friend of ours who has been collecting baby stuff for us through her work, the good folks at Humana! She brought tons of diapers, wipes, and other cool stuff! Not only has she been collecting from her co-workers, but she also sent out an email to one of their vendors who were hosting an office party at Humana’s headquarters, Austin Radiological Association, and asked them to donate. Apparently, someone at Austin Radiological knows Casey and rallied up three huge baskets of clothes, blankets, bibs, burp rags, etc…so awesome! Unfortunately, however we do not know who it is so if you happen to be reading this and you know who this incredible person is, please let them know how grateful we are! Thank you also, Ginger, for organizing this and bringing everything out to the house!! 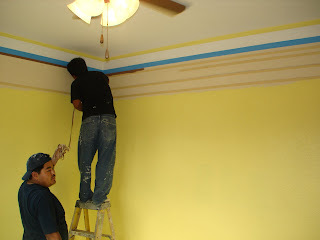 – I had my paint crews start today on the nursery. They got the first coat of paint on everything and will be back on Monday to finish up. – Another friend of ours called today to say she was headed our way with a high chair for us. That makes four high chairs…only one more to go! – Eliot has had a great week topped off by two sleepovers at her friend Maddy Brown’s. Our friends, Stacy and Mike Brown have been so incredible and have taken care of Eliot several nights in the last month when I had class. They picked her up Thursday after school and will be bringing her back tomorrow morning. Lots of fun with the little girls, but I’m guessing the Brown family is worn out!! I hope everyone had a great week and is looking forward to a relaxing weekend! !